This turtle (bonus for what kind) was smart for keeping a watch out for my errant iron play. I shot a 90. I've been keeping stats (F, GIR, P), and it is apparent my iron play is weak. It really helps to keep stats of your game. I also know that my game tops-out at the 6800 yard length. 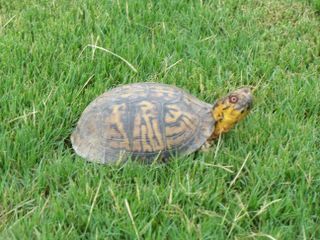 Next year Durham Lakes will be ready....and so will I.
I'd have to say an eastern box turtle. Correct! This is a male Eastern Box Turtle. Thanks for participating, I've added your blog to my BlogRoll.